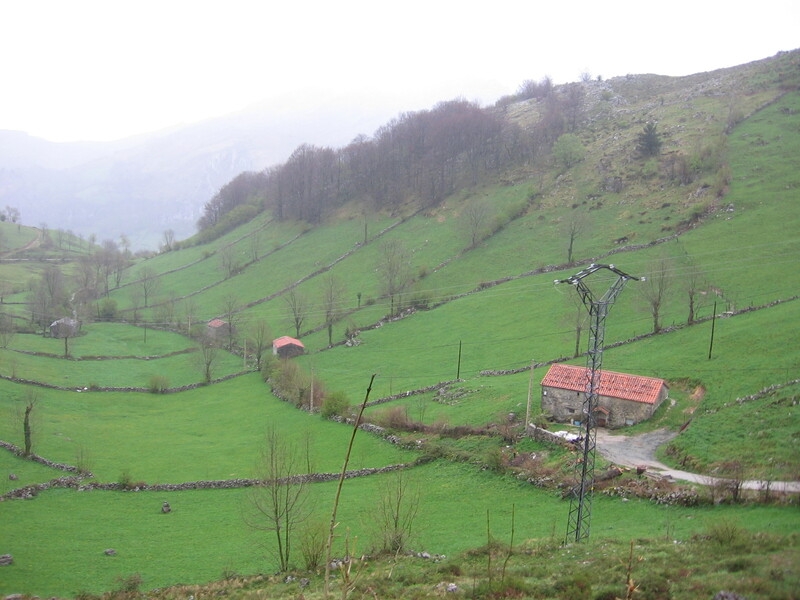 The photo below is from a valley in Cantabria, a province in the north of Spain. The year-round green valleys there are spectacular. These fields (the ones in the photo) are not fully flat nor rocky. The native grass is mixed and tender, and the size and layout of the fields are attractive to the eager scyther. A completely flat field looks great and welcoming, but is not the most comfortable to mow with a scythe. A field with a gentle inclination—where the scyther can push the cut grass down the hill rather than level to him or her—actually saves energy and therefore the scyther can cut a larger area. Single windrow is when you have a clean mowed area at your left and you build up (as you mow) a line of cut grass as you advance mowing, also at your left. The method is the most common. Double windrow is the accumulation of cut grass while mowing in both directions, up the field and down. In other words: It is mowing a single windrow (but this time, the uncut grass is on your left and you cut and accumulate grass against the uncut area), you have to return, and you reverse as if you were mowing a single windrow, but in the opposite direction. Now you have the uncut grass at your right, with the cut grass from your first pass on the left. It is a little more difficult to see (and feel) if you have fully cut the swath since you cannot see if the blade has gone all the way through. This entry was posted in Uncategorized and tagged cantabria, mowing, windrow by scytheman1. Bookmark the permalink.